Often, as I look at this cross, I think about how Jesus allowed Himself to be nailed to a cross so many years ago. As He hung there, He looked ahead through the ages and saw me sitting at my desk staring at this cross. He saw my life from beginning to end. He saw the fears, failures, tears I would cry. He saw the joy, peace, laughter I would feel. He saw me feeling demoralised, a failure, worthless. He saw me celebrating, confident, feeling worthy. He knew without a shadow of doubt that I would constantly struggle to obey His commands (especially the ‘love your neighbour’ and ‘do not judge’ ones). That I would fail Him countless times and yet He still chose to die for me. 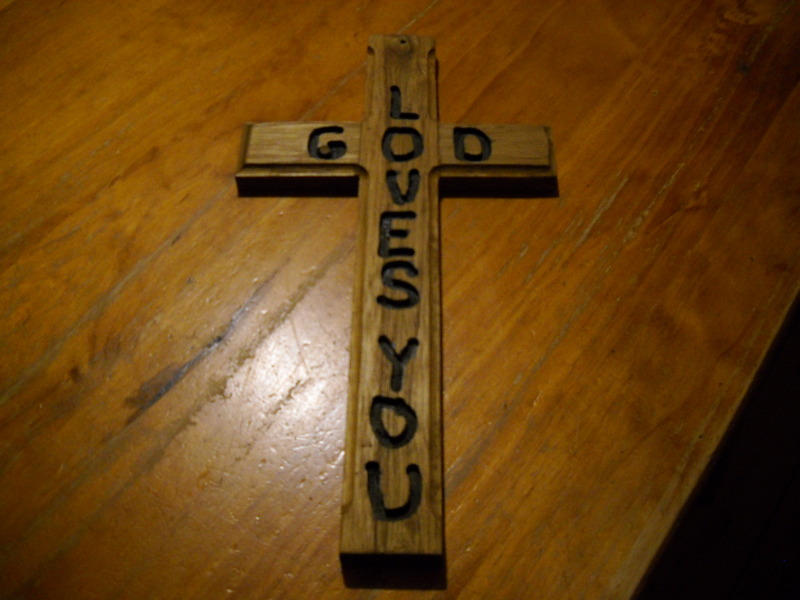 The words GOD LOVES YOU are deeply carved into this wooden cross. Just as a carving tool cut into this wood leaving deep dark scars, I see the back of His body scarred with wounds as He was whipped prior to being crucified. I see the scars on His hands and feet where they nailed Him to the cross. AND then I think of how often I make a mockery of His death because of lack of faith, because I refuse to take Him at His word, because I often don’t feel worthy of His death. It is then that I am reminded that His dying had nothing to do with my feelings. I may not feel worthy but He says I have immeasurable worth and I have to believe that. “This is what I am saying to you. Don’t be afraid, because I have saved you. I have called you by name, and you are Mine. When you pass through the waters, I will be with you. When you cross rivers, you will not drown. When you walk through the fire, you will not be burned, nor will the flames consume you. This is because I, the Lord am your God. You are precious to Me, because I give you honour and love you. Don’t be afraid because I am with you. I formed you and made you for My glory. I chose you so you would know and believe Me; so you would understand I am the true God. Forget what happened before, and do not think about the past. Look at the new thing I am going to do. It is already happening. Don’t you see it? I will make a road in the desert of your life, rivers in the dry land of your life, and you will sing songs of praise to Me. This entry was posted in God, Jesus, Life and tagged faith, grace, Love, restoration, wholeness. Bookmark the permalink.